We are closed for the 2018 season and will re-open in May 2019. We look forward to seeing you all in May! We’re getting closer – just 84 days until Memorial Day Weekend! Lumberjack Pass Miniature Golf is the ultimate miniature golf in Lake George, NY! Lumberjack Pass Mini Golf features 18 challenging championship holes in a beautiful Lake George Adirondack setting. 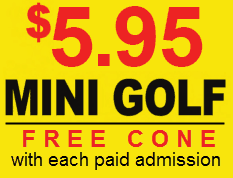 We are the Lake George Region’s largest, least expensive, and the only mini golf course in the region to offer our players a free soft serve ice cream treat for each paid admission. Our players say it best – We are the best deal in town! Our mini golf course is built on an acre of lushly landscaped Adirondack beauty. Listen to the soothing sounds of our streams and natural stone waterfall while enjoying the fun of miniature golf. The magnificent putting greens are full of undulations, water hazards, and real sand traps! You have to experience our misting stations – perfect for cooling down on those warm summer days! Come enjoy the fun today. Our course is 100% stroller friendly! And, then there’s FORE! Ice Cream Burgers & More! We’re more than just mini golf. Try our Lemonsicle soda – a Lumberjack original featuring a refreshing combination of lemon sorbet, vanilla ice cream, and lemon soda! Or try our signature peanut butter lover’s sundae – if you love peanut butter, this is for you! Check us out! ATM available on premises.